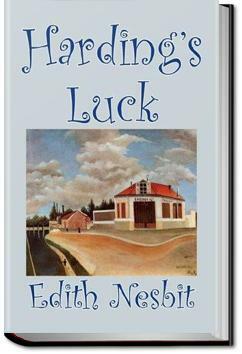 Harding's luck is sequel to E. Nesbit's "The House of Arden". It tells the story of Dickie Harding, a disabled boy, who one day accidentally discovers an old magic, that allows him to travel into his own past. There he meets Elfrida and Edred Arden (as told in "The House of Arden") and together they seek for a long lost treasure. . . .I know'd right enough," he said suddenly and hoarsely; "an' I needn't a-gone if I 'adn't wanted to." "He's feverish," said the lady, "he doesn't know what he's saying. Look how flushed he is." "I wanted to," said Dickie; "I thought it 'ud be a lark. And it was too." He expected to be shaken and put down. He wondered where his crutch was. Mr. Beale had had it under his arm. How could he get to Gravesend without a crutch? But he wasn't shaken or put down; instead, the lady gathered him up in her arms and stood up, holding him. "I shall put him to bed," she said; "you shan't ask him any more questions to-night. There's time enough in the morning." Oh, so good to read an undiscovered Nesbit! Makes me feel seven years old again. Something about her ability to put you in places, complete with scents and cool breezes and warm sunlight through your shirt - without mentioning any of these things, is a sort of magic I will always be in awe of. The story of a courageous and noble young boy. 3.5 stars-- I enjoyed this more than "House of Arden," but I doubt I will ever want to revisit it. Dickie was a dear, though. Not crazy about the ending, but at the same time I'm glad he got to be happy... yet I don't entirely understand what happened to the first Dickie who was there. I definitely recommend reading the first book in the series before this one. It was very enjoyable, but I dropped a star because I didn't like the ending.